$175 per new family--$125 per returning family if paid by March 1 (After March 1 returning families must pay the new family fee). Tuition Agreement form available here. Please Note: Any family unable to meet these payments and who ardently desire a Catholic Education for their children are to please fill out the Grant and Aid Application at www.online.factsmgt.com/signin/3RSYQ. Neither the Pastor, or the Principal, or School Advisory Board want to turn anyone away who wishes their children to attend Saint Ann Catholic School. * Copies of your 2018 W-2 forms for both you and your spouse. If you have any questions or concerns about the application process, you may speak with the FACTS Customer Care Representative at 1-866-441-4637. A parish participation form can be acquired here. 1. Be baptized as a Catholic. 2. Be registered in the parish. 3. Attend Mass regularly and contribute to the support of the church through envelopes. St. Ann Parish Rosters are checked two times per year to determine the level of involvement of those claiming St. Ann as their parish. In order to continue the Parish Rate, parishioners must show active involvement in the church and its functions. All families are expected to volunteer at least 10 hours per year to offset the subsidy received. In addition, participation in fund raisers is important in order to meet the budgetary requirements for the cost of each student. Kindergarten students will be screened in May prior to their entrance into the school. Families moving to the area at a later date will be scheduled at a time when the kindergarten teacher is available. 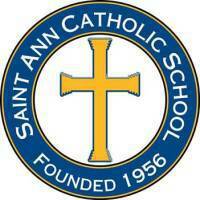 Should a family find it necessary to withdraw from St. Ann School prior to the end of the academic year, one month's tuition will be assessed. This requirement will be waived if written proof is provided that the withdrawal is the result of a geographical move caused by employment transfer. Twelve payments paid June through May through FACTS Tuition Management Company. A voided check must accompany the application for monthly tuition. Monthly amounts will be adjusted for those who register later than June. For example, registration in July means that tuition will be paid over eleven months (beginning in July), August payment will be based on ten months, etc. Registration after school starts will be prorated. We are able to accept credit/debit cards for all tuition and fees. We accept Visa, MasterCard and Discover.